Chhattisgarh Assembly Polls: Several exit polls have predicted a neck-and-neck fight between the big two and some have projected victory for the Rahul Gandhi-led party. 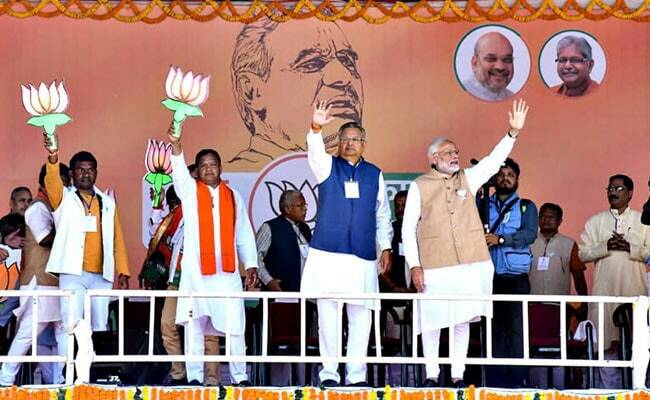 Counting of votes will be held today for the Chhattisgarh Assembly polls, being viewed as a prestige battle for three-term Chief Minister Raman Singh of the BJP and the opposition Congress' fight for resurgence. "Counting for all 90 seats would start at 8 am at the 27 district headquarters. All preparations have been completed and a three-layer security has been arranged at each counting centre," an election official told PTI. Counting of postal ballots will begin at 8 am and half-an-hour after they are counted, the process to count votes from the Electronic Voting Machines (EVMs) will begin, he said. As many as 5,184 counting personnel and 1,500 micro-observers have been appointed for smooth conduct of the process, he said. In every counting hall, 14 tables will be arranged in rows of seven tables each, apart from separate tables for the returning officer and for counting of postal ballots, the official said. On the eve of counting of votes, the BJP and the Congress claimed victory, while Mr Jogi's outfit also expressed confidence of forming the next government. Brushing aside predictions of a Congress win being made by several exit polls, Mr Kaushik said the post-election surveys were based on assumptions only. "In democracy, a government is not formed based on assumptions but is elected by the trust of people and development schemes coupled with pro-people policies", he said. Mr Kaushik also rejected the predictions of a hung assembly and said the BJP will romp home with majority. "On Tuesday, the state will get rid of the BJP government and its misrule, and the Congress will script a history by winning more than 50 seats", he said. JCC (J) Spokesperson Iqbal Ahmed Rizvi claimed the people have lost faith in both the BJP and the Congress. "Ajit Jogi will become chief minister after the alliance of three parties will come to power on Tuesday", he said. During campaigning, the Congress tried to build a narrative against the BJP by highlighting issues such as "misrule" and "agrarian distress". Congress chief Rahul Gandhi had announced that his party would waive crop loans of farmers within ten days of coming to power in Chhattisgarh. He had said the money for the waiver would come from the "likes of" Vijay Mallya, Nirav Modi and Anil Ambani. On the other hand, Prime Minister Narendra Modi had targeted the Congress and the Nehru-Gandhi family, saying they were the "only beneficiaries" of power.